Although M-CSF has been used for myelosuppression due to chemotherapy in patients with solid tumors, the effect of exogenous M-CSF on tumor angiogenesis has not been studied. In this study we showed that M-CSF has the ability to accelerate solid tumor growth by enhancing angiogenesis with a novel mechanism. M-CSF accelerated intratumoral vessel density in tumors inoculated into mice, although it did not accelerate the proliferation of malignant cells and cultured endothelial cells in vitro. In both the absence and the presence of tumors, M-CSF significantly increased the circulating cells that displayed phenotypic characteristics of endothelial progenitor cells in mice. Moreover, M-CSF treatment induced the systemic elevation of vascular endothelial growth factor (VEGF). 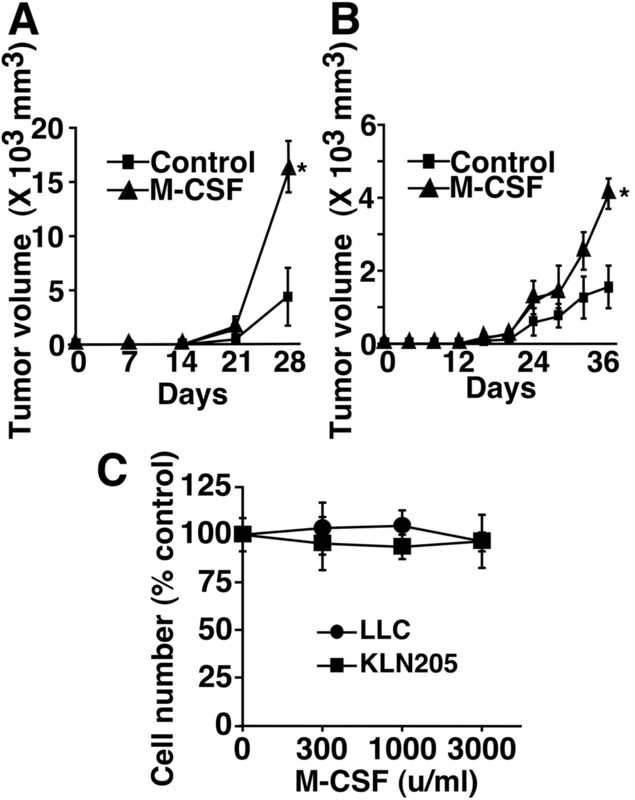 VEGFR-2 kinase inhibitor significantly impaired the effect of M-CSF on tumor growth. 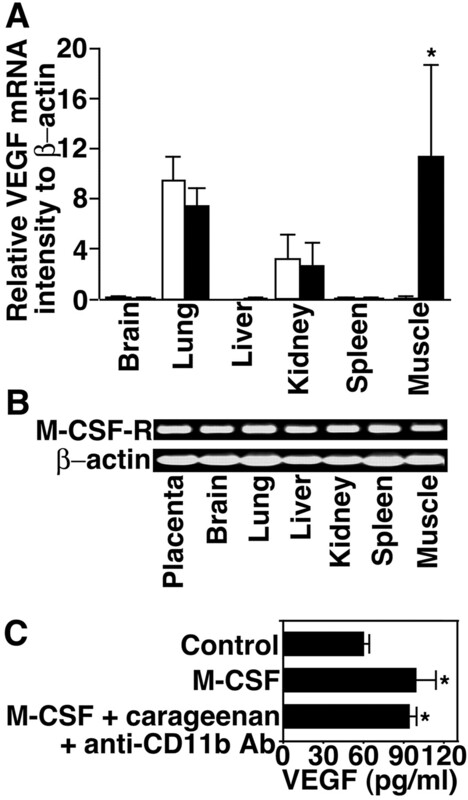 In vivo, M-CSF increased VEGF mRNA expression in skeletal muscles. Even after treatment with carageenan and anti-CD11b mAb in mice, M-CSF increased VEGF production in skeletal muscles, suggesting that systemic VEGF elevation was attributed to skeletal muscle VEGF production. In vitro, M-CSF increased VEGF production and activated the Akt signaling pathway in C2C12 myotubes. 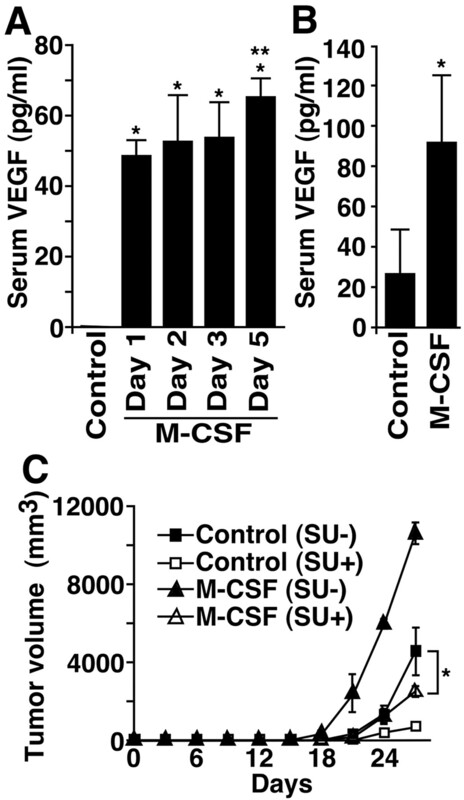 These results suggest that M-CSF promotes tumor growth by increasing endothelial progenitor cells and activating angiogenesis, and the effects of M-CSF are largely based on the induction of systemic VEGF from skeletal muscles. Myelosuppression and the resultant infection are potentially life-threatening side effects of cancer chemotherapy. The use of dose-intensive chemotherapeutic regimens and the expanding application of chemotherapy to older patients have made the management of myelosuppression increasingly important. M-CSF, which was the initially characterized hemopoietic growth factor, is used to treat these patients to ameliorate myelosuppression and prevent severe infections (1, 2). M-CSF stimulates the survival, proliferation, and differentiation of cells of the mononuclear phagocyte lineage (3). M-CSF reduced the incidence and duration of febrile neutropenia in acute myeloid leukemia patients and ovarian cancer patients during chemotherapy (1, 4) and improved the long term prognosis of ovarian cancer patients with no residual tumors (5). Furthermore, M-CSF was reported to have an antitumor effect (2, 6, 7). In contrast, inhibition of M-CSF was indicated to have an antitumor effect (8). Thus, the relationship between M-CSF and tumor growth is still controversial. Therefore, it is important to study the effect of M-CSF on tumor growth and clarify the mechanisms. Because blood supply is essential for solid tumors, tumor growth is highly dependant on angiogenesis. In the conventional view, angiogenesis is mediated by the local proliferation and migration of vessel wall-associated endothelial cells (ECs)3 that emerge from their resting state in response to angiogenic growth factor (9). However, recent work suggests that circulating cells with the potential to differentiate into mature ECs, so-called circulating endothelial progenitor cells (EPCs), may also contribute to tumor angiogenesis (10, 11). GM-CSF and G-CSF are also widely used to treat myelosuppressed patients during chemotherapy. GM-CSF has been indicated to promote angiogenesis (12) and mobilize EPCs into the peripheral circulation from bone marrow (13). G-CSF has been reported to promote tumor growth and angiogenesis (14). However, the effects of M-CSF on tumor angiogenesis and EPC mobilization have not been studied. Among angiogenic factors, vascular endothelial growth factor (VEGF) has been reported to have a crucial role in tumor angiogenesis by directly activating ECs (15). Moreover, VEGF has been reported to mobilize EPCs into peripheral circulation from bone marrow (16, 17). In this study we investigated the effect of M-CSF on tumor growth and angiogenesis in vivo and the possible involvement of EPCs. Our findings suggest that M-CSF performs its effects via systemic elevation of VEGF. Lewis lung carcinoma cells (LLCs), KLN205 cells, NIH-3T3 cells, RAW 264.7 cells, and C2C12 cells were purchased from American Type Culture Collection. LLCs, NIH-3T3 cells, and RAW 264.7 cells were cultured in high glucose DMEM containing 10% FCS, 100 U/ml penicillin, and 0.1 mg/ml streptomycin. KLN205 cells were cultured in MEM containing 10% FCS, 1% nonessential amino acids, and 100 μg/ml kanamycin. C2C12 myoblasts were cultured in DMEM containing 10% FCS, 100 U/ml penicillin, and 0.1 mg/ml streptomycin (growth medium (GM)). To induce differentiation of C2C12 myoblasts to C2C12 myotubes, the culture medium of C2C12 myoblasts at 80–90% confluence was shifted to DMEM supplemented with 2% FCS, 100 U/ml penicillin, and 0.1 mg/ml streptomycin (differentiation medium (DM)). HUVEC were purchased from Cambrex and were cultured in EC growth medium (Cambrex). Normal adult human dermal microvascular endothelial cells (HMVEC), originally derived from foreskins, were purchased from Kurabo and cultured in HuMedia-MvG (Kurabo). Human M-CSF (mirimostim) was obtained from Kyowa Hakko Kogyo. The endotoxin concentration of the M-CSF in the same lot we used was determined using the kinetic turbidimetric technique with the endotoxin-specific LAL ES-Test (Wako Pure Chemical Industries). The procedure was previously described (18), and Japanese standard endotoxin, which is a lyophilized preparation of endotoxin extracted from the Escherichia coli UKT-B strain, was used as a standard. The measured endotoxin concentration in the M-CSF was 0.04 endotoxin unit/1 × 106 U M-CSF. M-CSF was dissolved in endotoxin-guarantee PBS (Invitrogen Life Technologies) at a concentration of 16 × 104 U/ml as a stock solution. For in vivo experiments, we diluted the M-CSF stock solution by endotoxin-guarantee PBS (Invitrogen Life Technologies) and injected the mice s.c. at a dosage of 32 × 104 U/kg body weight. For in vitro experiments, the M-CSF stock solution was directly diluted by culture mediums. LLCs were injected (3 × 105 cells/animal) s.c. into the flank of male 6- to 9-wk-old C57BL/6 mice on day 0. KLN 205 cells were injected (5 × 105 cells/animal) s.c. into the flank of male 6- to 9-wk-old BDF1 mice on day 0. Tumor size was quantified daily as width2 × length × 0.52. For tumor growth rate models, M-CSF (mirimostim; Kyowa Hakko Kogyo; 32 × 104 U/kg body weight) was injected s.c. into the contralateral flank of the tumor cell-injected side twice a week from day 10. Mice inoculated with LLCs were killed on day 28 (total of five M-CSF injections per mouse). Mice inoculated with KLN205 cells were killed on day 36 (total of seven M-CSF injections per mouse). For assay of EPC culture and quantification of plasma VEGF, mice were inoculated with LLCs on day 0, treated with M-CSF for 3 days daily from day 25, and killed on day 28. For models of tumor growth inhibition by SU1498, mice were inoculated with LLCs on day 0. From day 9, mice were injected i.m. with SU1498 (Calbiochem), then injected with SU1498 three times a week. M-CSF was s.c. injected into mice twice a week from day 10, and mice were killed on day 28. Mice were treated with 400 μg of SU1498 dissolved in 100 μl of DMSO for each injection. Control mice were treated with DMSO. Human M-CSF (32 × 104 U/kg body weight) dissolved in 100 μl of PBS was used for each injection. Control mice were injected s.c. with PBS. The cell proliferation assay was performed as previously described (19). Briefly, LLCs (5 × 103 cells), KLN205 cells (5 × 103 cells), HUVEC (3 × 103 cells), or HMVEC (3 × 103 cells) were plated onto 96-well plates and incubated with 0, 300, 1000, or 3000 U/ml M-CSF. LLCs were cultured for 48 h. KLN205 cells, HUVEC, and HMVEC were cultured for 72 h, then cell number was determined by water-soluble tetrazolium (WST) assay using a cell counting kit (Dojindo). Mononuclear cells were isolated, cultured, and characterized as previously described with some modifications (20). First, mononuclear cells were isolated from 700 μl of peripheral blood from each mouse using density gradient centrifugation with Lymphosepar II (IBL). After isolation, 4 × 106 cells were plated on dishes coated with human fibronectin (BD Biosciences) and maintained in endothelial basal medium (Kurabo), supplemented with 20% FCS, 100 ng/ml recombinant mouse VEGF (R&D Systems), 1 μg/ml hydrocortisone, 10 ng/ml human endothelial growth factor, 50 μg/ml gentamicin, 50 ng/ml amphotericin B, 5 ng/ml human fibroblast growth factor, 10 μg/ml heparin, and 39.3 μg/ml dibutyryl cAMP. After 4 days, medium was changed, and cells were washed with PBS. Adherent cells were incubated with 2.4 μg/ml acetylated low density lipoprotein, Dil complex (Dil-acLDL; Molecular Probes) for 1 h. Cells were fixed in 2% paraformaldehyde for 10 min and stained with 10 μg/ml FITC-labeled lectin from Ulex europaus (Sigma-Aldrich) for 1 h. Fluorescent microscopy identified double-positive cells as EPCs. Two independent investigators evaluated the number of double-positive cells in each well by counting three randomly selected high power fields. FITC-labeled anti-CD34 mAb and purified rat anti CD144 (vascular endothelial (VE)-cadherin) mAb were purchased from BD Pharmingen. PE-labeled anti M-CSFR mAb and control rat IgG2a were purchased from eBioscience. Mononuclear cells in peripheral blood were isolated and cultured for 4 days, as described for the culture assay of circulating EPCs. Then the cells were washed with PBS, and adherent cells were scraped off with a cell scraper (Iwaki) and suspended in PBS. C2C12 myoblasts were cultured in GM, treated with trypsin EDTA, and suspended in PBS. C2C12 myotubes were cultured in DM from day 0. The medium was changed on days 1 and 4. From day 6, M-CSF was added to DM (400 U/ml). On day 8, C2C12 myotubes were treated with trypsin-EDTA and suspended in PBS. The cells were first incubated with unlabeled anti-CD16/32 mAb (eBioscience) to block nonspecific binding to the FcγR. After washing, the cells were incubated on ice with a mixture of FITC-, PE-, and nonlabeled Abs. The cells incubated with anti-CD144 mAb were then incubated with FITC-labeled anti rat IgG (H+A) (eBioscience). After washing again, the cells were subjected to flow cytometry on a FACScan (BD Bioscience), and the data were analyzed with CellQuest software (BD Bioscience). For all samples, dead cells were excluded from the analysis by propidium iodide staining. When the diameter of the tumor became ∼1 cm, tumor tissues were fixed in 10% formalin, embedded in paraffin, and sectioned. Control mice were killed 2 days after the M-CSF-treated animals. They were blocked with 10% normal goat serum and incubated with polyclonal anti-human factor VIII-related Ag Ab (DakoCytomation). Subsequently, the sections were incubated first with biotinylated goat anti-rabbit IgG (Vector Laboratories) and then with the ABC kit (Vector Laboratories), detected by 3-amino-9-ethylcarbazole (Vector Laboratories), and counterstained with hematoxylin. The intratumoral microvessel density was determined as previously described (21, 22). In brief, the intratumoral vessels were stained immunohistochemically with anti-human factor VIII-related Ag Ab. The image that contained the highest number of microvessels was chosen for each section by an initial scan at ×100 magnification. Then the vessels were counted in the selected image at ×200 magnification. At least four fields were counted for each section, and the highest count was taken. Two independent investigators evaluated the number of vessels. The concentrations of VEGF in plasma, muscles, and cell culture supernatants were determined using a murine VEGF ELISA kit (R&D Systems) according to the manufacturer’s recommendation. For determination of VEGF in plasma, mice were treated with M-CSF (32 × 104 U/kg body weight) daily for 1, 2, 3, or 5 days. Then the inferior vena cava of the mouse was punctured, peripheral blood was collected, and plasma was isolated. For determination of VEGF in skeletal muscles, mice were injected with M-CSF (32 × 104 U/kg body weight) into the flank s.c. daily for 3 days. The right femoral muscle of mice was isolated and homogenized in PBS. After centrifugation, the protein level in supernatants was determined and adjusted to 10 mg/ml using a bicinchoninic acid protein assay kit (Pierce), and the supernatants were assayed for VEGF production. NIH-3T3 cells (5 × 104 cells) and RAW 264.7 cells (1 × 105 cells) were plated onto 24-well plates and cultured with or without M-CSF (400 U/ml). NIH-3T3 cells were cultured for 48 h. RAW 264.7 cells were cultured for 96 h. Then the culture supernatants were collected and assayed for VEGF production. C2C12 myoblasts (1 × 105 cells) were plated onto 24-well plates and cultured in GM with or without M-CSF (400 u/ml). After 24 h, the culture supernatants were collected and assayed for VEGF production. To obtain supernatants from C2C12 myotubes, the cells (1 × 105 cells) were plated onto 24-well plates and cultured in GM on day 0. From day 1, C2C12 cells were cultured in DM. From day 3, the cells were cultured with or without M-CSF (400 U/ml). DM was changed daily. DM collected on day 6 was subjected to VEGF production. For culture assay of C2C12 myotubes with Abs, rat anti-mouse M-CSFR mAb was purchased from Serotec, and control rat IgG was purchased from Sigma-Aldrich. C2C12 cells (1 × 105 cells) were plated onto 24-well plates and cultured in GM on day 0. From day 1, C2C12 cells were cultured in DM. DM was changed daily. C2C12 myotubes were cultured with M-CSF (400 U/ml), M-CSF and rat control IgG (500 ng/ml), or M-CSF and anti-M-CSFR mAb (500 ng/ml) from day 4. C2C12 myotubes were cultured in the same DM for the following 4 days. DM collected on day 8 was subjected to VEGF production. Carageenan (type IVλ; Sigma-Aldrich) treatment was performed as previously described (23, 24). Briefly, carageenan was dissolved in sterile PBS at 5 mg/ml. The solution was heated to 56°C to ensure complete solubilization. Mice were treated with an i.p. injection of 200 μl (1 mg) of carageenan on days 1 and 4. Control mice received 200 μl of sterile PBS. Rat anti-mouse CD11b mAb (5C6; Serotec) treatment was performed as previously described (25, 26). Mice were treated with an i.p. injection of 0.5 mg of anti-mouse CD11b mAb on days 3 and 5. Control mice received 500 μl of sterile PBS. M-CSF (32 × 104 U/kg body weight) was injected into the flank of mice s.c. on days 3, 4, and 5. Mice were killed on day 6. Right femoral muscles were isolated, homogenized in PBS, and centrifuged, and the supernatants were subjected to ELISA. Total RNA was isolated from the indicated organs with or without M-CSF (32 × 104 U/kg body weight) treatment daily for 3 days using RNAzol B reagent (Tel-Test) following the manufacturer’s instructions, except for placenta. Placenta total RNA was purchased from BD Biosciences. Gene expression of VEGF was determined by quantitative RT-PCR using specific oligonucleotide primers and TaqMan probes purchased from Applied Biosystems (Assays-on-Demand Products; mouse VEGF, Mm00437304). We simultaneously determined the expression of the housekeeping gene β-actin, which served as a standard, using the following primers and probes: forward, 5′-ACGGCCAGGTCATCACTATTG-3′; reverse, 5′-CCAAGAAGGAAGGCTGGAAAA-3′; and TaqMan probe, 5′-FAM-CAACGAGCGGTTCCGATGCCC-TAMRA-3′. Real-time RT-PCR amplification was conducted in duplicate in 50-μl reaction volumes containing 4 ng of total RNA for each specific reaction, using a TaqMan One-Step RT-PCR Master Mix Reagents kit (Applied Biosystems). The thermal profile was 48°C for 30 min, 95°C for 10 min, 95°C for 15 s, and 60°C for 1 min for 40 cycles and incubation was performed at 25°C. The fluorescence emitted by the reporter dye (FAM; peak fluorescence emission at 518 nm) was detected online in real time with the ABI PRISM 7700 Sequence Detection System (Applied Biosystems). All reactions included β-actin amplification as an internal standard. Conventional RT-PCR for M-CSFR was performed as previously described (27). The following primers were used: M-CSFR, 5′-GCGATGTGTGAGCAATGGCAGT-3′ and 3′-AGACCGTTTTGCGTAAGACCTG-5′; and β-actin, 5′-GTGGGCCGCTCTAGGCACCAA-3′ and 5′-CTCTTTGATGTCACGCACGTATTC-3′. Western blot analysis was performed as previously described (28). In brief, C2C12 myoblasts (5 × 106 cells) were plated onto culture dishes in GM on day 0. From day 1, cells were cultured in DM. DM was changed daily. On day 8, the cells were serum-starved for 6 h, then stimulated with serum-free DMEM containing M-CSF (400 U/ml) for 0, 10, and 30 min. The cells were lysed in buffer containing 50 mM Tris-HCl (pH 8.0), 150 mM NaCl, 1% Nonidet P-40, 0.5% deoxycholate, 0.1% SDS, 1 mM PMSF, and 1 μg/ml aprotinin. After centrifugation, cell lysates were subjected to 12% SDS-PAGE and transferred onto polyvinylidene difluoride membranes (Millipore). The membrane was blotted with Abs to phospho-Akt (Cell Signaling Technology) or M-CSFR (Santa Cruz Biotechnology). The membrane blotted with the Ab to phospho-Akt was then reblotted with an Ab to total Akt (Cell Signaling Technology). The membranes were developed with an ECL Western Blotting Detection System Plus (Amersham Biosciences) according to the manufacturer’s instructions. Statistical analysis of the results was performed using ANOVA with Fisher’s least significant difference test for multiple comparisons. A value of p < 0.05 was considered significant. LLCs were inoculated into the flank of C57BL/6J mice s.c. on day 0. From day 10, we injected M-CSF or PBS s.c. into the contralateral flank of the LLC-injected side twice a week. Compared with PBS treatment, M-CSF treatment significantly accelerated tumor growth (Fig. 1⇓A). Similar results were obtained from the inoculation of squamous carcinoma cells, KLN205 cells (Fig. 1⇓B). We next examined the direct effect of M-CSF on the proliferation of LLCs and KLN205 cells in vitro. We cultured LLCs and KLN205 cells in various concentrations of M-CSF. M-CSF had no effect on cell proliferation in vitro (Fig. 1⇓C). We also cultured LLCs and KLN205 cells with 0, 300, 1000, or 3000 U/ml M-CSF and counted the cells on days 3, 4, 5, and 6. We could not find a significant effect of M-CSF at any concentration on the cell proliferation rate (data not shown). M-CSF treatment accelerated tumor growth in vivo, but not in vitro. A, Mice were injected s.c. with LLCs on day 0 and were treated with PBS or M-CSF from day 10, twice a week. Results are presented as the mean ± SD of eight mice in each group, and the difference in tumor volume on day 28 between control and M-CSF-treated mice was statistically significant (∗, p < 0.01). B, Mice were injected s.c. with KLN205 cells on day 0 and were treated with PBS or M-CSF from day 10, twice a week. Results are presented as the mean ± SD of eight mice in each group, and the difference in tumor volume on day 36 between control and M-CSF-treated mice was statistically significant (∗, p < 0.01). C, LLCs and KLN205 cells (5 × 103 cells) were cultured with the indicated amounts of M-CSF. LLCs were cultured for 48 h, and KLN205 cells were cultured for 72 h. Cell number was determined by WST assay. Data are shown as the mean ± SD of triplicate samples. Similar results were obtained from three independent experiments. H&E staining of the tumor tissues revealed an increase in vessels in tumor tissues from M-CSF-treated mice (Fig. 2⇓, A and C). To confirm the vessels, we stained paraffin sections immunohistochemically using an Ab against factor VIII-related Ag (Fig. 2⇓, B and D). Factor VIII-related Ag is a well-established cell surface marker of vascular endothelial cells (22). Compared with control mice, we found an increased number of tumor vessels in M-CSF-treated mice. The difference in MVD between control and M-CSF-treated mice was statistically significant (Fig. 2⇓E). M-CSF treatment induced an increase in vessel density in tumor tissues, but did not affect the proliferation of cultured ECs. Mice were injected s.c. with LLCs. When the diameter of the tumors reached 1 cm, mice were killed. Tumors were resected and embedded in paraffin. Tumor tissues from control (A and B) and M-CSF-treated (C and D) mice are shown. A and C, Paraffin sections were stained with H&E and observed under lower magnification (×200) and higher magnification (insets; ×400). B and D, Paraffin sections were stained immunohistochemically using an Ab against factor VIII-related Ag (original magnification, ×200). The images represent one of eight mice in each group. E, MVD was counted. Results are indicated as the mean ± SD of eight mice in each group. The difference in MVD between control and M-CSF-treated mice was statistically significant (∗, p < 0.01). F, HUVEC (3 × 103 cells) and HMVEC (3 × 103 cells) were cultured with the indicated amounts of M-CSF for 72 h. Cell number was determined by WST assay. Data are shown as the mean ± SD of triplicate samples. Similar results were obtained from three independent experiments. To investigate whether M-CSF induced the proliferation, differentiation, and development of sprouts from pre-existing ECs, we examined the direct effects of M-CSF on the proliferation of HUVEC and normal adult HMVEC. We cultured HUVEC and HMVEC with various concentrations of M-CSF. M-CSF had no effect on the proliferation of HUVEC or HMVEC in vitro (Fig. 2⇑F). We also cultured HUVEC and HMVEC with 0 or 1000 U/ml M-CSF and counted the cells on days 2, 3, 4, and 5. We could not find a significant effect of M-CSF on the proliferation rate or morphological changes in HUVEC or HMVEC (data not shown). Because M-CSF did not have a direct effect on the proliferation of HUVEC, we hypothesized that the increase in vessel density was the result of an increase in circulating EPCs. We isolated mononuclear cells in peripheral blood, cultured the cells, and characterized EPCs as adherent cells double positive for Dil-acLDL uptake and lectin binding as previously described (Fig. 3⇓A) (17, 29, 30). 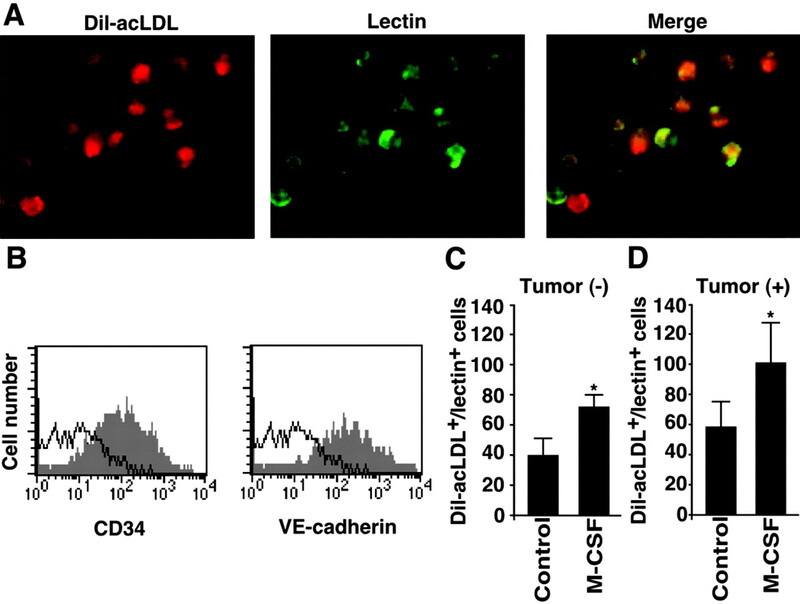 We also confirmed the expression of well-established murine endothelial-specific markers CD34 and VE-cadherin on adherent cells by FACS analysis (Fig. 3⇓B) (30, 31). To investigate the effects of M-CSF on the increase in Dil-acLDL uptake and lectin binding cells in peripheral blood, mice were injected with M-CSF for 3 days. M-CSF treatment resulted in a significant increase in double-positive cells compared with controls (Fig. 3⇓C). To further investigate the effect of M-CSF on the increase in circulating EPCs in cancer animal models, we inoculated LLCs into mice on day 0, and 25 days after inoculation, we treated them with M-CSF for 3 days. This treatment also significantly increased the number of double-positive cells in M-CSF-treated mice (Fig. 3⇓D). M-CSF treatment increased circulating EPCs. A, Mononuclear cells were isolated from peripheral blood and cultured. Dil-acLDL uptake (left panel) and lectin binding (middle panel) of adherent cells were determined by fluorescence microscopy. Double-positive cells (merge) were considered EPCs (right panel). B, Expression of CD34 and VE-cadherin on EPCs. The shaded histograms indicate staining with the indicated mAb, and the blank histograms indicate background staining with control IgG. C, M-CSF was injected into mice for 3 days. The mice were then killed. Mononuclear cells (4 × 106 cells/mouse) were isolated from peripheral blood and cultured. Adherent Dil-acLDL and lectin double-positive cells were counted. The number is the average of three high power fields per mouse. Results are indicated as the mean ± SD of six mice in each group. M-CSF treatment significantly increased the number of double-positive cells (∗, p < 0.01). D, Mice were inoculated with LLCs on day 0. From day 25, M-CSF was injected into the mice for 3 days. Mice were killed on day 28. Mononuclear cells (4 × 106 cells/mouse) were isolated from peripheral blood and cultured. Adherent Dil-acLDL and lectin double-positive cells were counted. The number is the average of three high power fields per mouse. Results are indicated as the mean ± SD of six mice in each group. M-CSF treatment significantly increased the number of double-positive cells (∗, p < 0.01). VEGF has been shown to mobilize EPCs into the peripheral circulation (16, 17). Therefore, we examined the plasma level of VEGF in mice. We treated mice with M-CSF daily for 1, 2, 3, or 5 days and isolated the plasma. M-CSF treatment for 1 day induced a significant elevation of plasma VEGF, whereas VEGF was not detectable in plasma from the control mice (Fig. 4⇓A). M-CSF treatment for 2 or 3 days induced a similar elevation in plasma VEGF, and M-CSF treatment for 5 days significantly enhanced the elevation of plasma VEGF level compared with the effect of M-CSF treatment for 1 day (Fig. 4⇓A). We next inoculated LLCs into mice and treated them as shown in Fig. 3⇑D. Inoculation of the LLCs itself induced elevation of the plasma VEGF level in control mice, and M-CSF treatment significantly enhanced the plasma VEGF level in LLC-bearing mice (Fig. 4⇓B). VEGF has been reported to contribute to angiogenesis through activation of VEGFR-2 (VEGFR-2/kinase insert domain containing receptor/Flk-1), and SU1498 is a potent and selective inhibitor of the VEGFR-2 tyrosine kinase (32). To confirm the role of plasma elevation of VEGF after M-CSF treatment, we injected SU1498 and M-CSF into the mice. On day 0, we inoculated LLCs into mice, and from day 9, we administered SU1498 into mice three times a week. From day 10, mice were injected with M-CSF twice a week. The M-CSF and SU1498 combined injection inhibited tumor growth, and the growth rate was significantly lower than that in control mice without SU1498 administration (Fig. 4⇓C). The M-CSF and SU1498 combined injection did not impair the tumor growth rate to a level comparable to that in control mice with SU1498 administration (Fig. 4⇓C). These results suggested that M-CSF might perform its effects in vivo at least in part through the elevation of plasma VEGF. M-CSF treatment induced elevation of the plasma VEGF level. A, Mice were treated with M-CSF for 1, 2, 3, or 5 days daily, and the plasma VEGF level was determined by ELISA. Results are indicated as the mean ± SD of eight mice in each group. M-CSF treatment induced the elevation of the plasma VEGF level, but VEGF was not detected in plasma from control mice (∗, p < 0.01). Compared with M-CSF treatment for 1 day, M-CSF treatment for 5 days significantly enhanced the elevation of plasma VEGF (∗∗, p < 0.03). B, Mice were inoculated with LLCs on day 0 and treated with M-CSF daily for 3 days, from day 25. On day 28, the plasma VEGF level was determined. Inoculation of LLCs induced the elevation of plasma VEGF. M-CSF treatment enhanced the elevation of plasma VEGF. The difference in plasma VEGF levels was statistically significant (∗, p < 0.01). Results are indicated as the mean ± SD of eight mice in each group. C, Mice were inoculated with LLCs on day 0 and treated with M-CSF as shown in Fig. 1⇑. From day 9, SU1498 was injected into mice three times a week (SU+). DMSO was injected into mice as a control (SU−). Results are indicated as the mean ± SD of five mice in each group. The M-CSF and SU1498 combined injection inhibited tumor growth, and the difference in tumor growth rate vs. control mice without SU1498 administration was statistically significant (∗, p < 0.05). To identify the origin of VEGF after M-CSF treatment, we treated mice with M-CSF for 3 days and isolated the brain, lung, liver, kidney, spleen, and femoral skeletal muscle. We isolated cytoplasmic RNA from these organs, subjected it to quantitative RT-PCR, and determined the VEGF gene expression. M-CSF treatment markedly induced VEGF gene expression in the femoral skeletal muscle, and the difference was statistically significant (Fig. 5⇓A). In the lung and kidney, VEGF gene expression was observed in both control and M-CSF-treated mice (Fig. 5⇓A). M-CSFR gene expression in each organ was confirmed by conventional RT-PCR. Placenta-derived mRNA was used as a positive control, and M-CSFR gene expression was detected in all indicated organs (Fig. 5⇓B). We performed conventional RT-PCR without primers as a negative control and could not detect any band (data not shown). To confirm M-CSF-induced VEGF production in skeletal muscles on the protein level, we treated mice with M-CSF for 3 days and isolated femoral muscles. The femoral muscles were homogenized in PBS and centrifuged, and the supernatants were subjected to ELISA. M-CSF treatment significantly induced the elevation of VEGF level in skeletal muscles at the protein level (Fig. 5⇓C). Recently, M-CSF was reported to induce VEGF production from human monocytes in vitro (33). To clarify whether the skeletal muscle itself or monocytes/macrophages in the skeletal muscle produced VEGF after M-CSF treatment, we tried to eliminate monocytes/macrophages in mice. Carageenan treatment has been reported to eliminate macrophages in mice (23, 24). Injection of anti-CD11b mAb (5C6) has been reported to inhibit the recruitment of macrophages/monocytes to inflamed lesions in mice (25, 26). We treated mice with carageenan, anti-CD11b mAb, and M-CSF. Then the femoral muscles were isolated, homogenized in PBS, and centrifuged, and the supernatants were subjected to ELISA. This treatment did not affect the VEGF level in femoral muscles after M-CSF treatment (Fig. 5⇓C). M-CSF treatment induced skeletal muscle VEGF production in vivo. A, ▪, M-CSF treatment; □, controls. M-CSF was injected s.c. into the flank of each mouse daily for 3 days. Total RNA was isolated from the indicated organs. VEGF gene expression was determined using quantitative RT-PCR. M-CSF significantly induced VEGF gene expression in skeletal muscles (∗, p < 0.05). Results are presented as the mean ± SD of five mice in each group. B, M-CSFR expression was determined using conventional RT-PCR. Placenta-derived RNA was used as a positive control. The upper panel indicates gene expression of M-CSFR, and the lower panel indicates gene expression of β-actin. C, Right femoral muscles of mice were isolated, homogenized in PBS, and centrifuged. The supernatants containing 10 mg/ml protein were subjected to ELISA, and the VEGF level was determined. M-CSF + carageenan + anti-CD11b Ab, Treatment with M-CSF, carageenan, and anti-CD11b mAb (5C6). Mice were treated with i.p. injection of carageenan (1 mg) on days 1 and 4. Anti-CD11b mAb (0.5 mg) was administrated i.p. on days 3 and 5. M-CSF was injected s.c. into the flank of the mice on days 3, 4, and 5. On day 6, the mice were killed, and the right femoral muscles were isolated. M-CSF treatment significantly induced VEGF in femoral muscles at the protein level (∗, p < 0.05). The carageenan and anti-CD11b mAb treatment did not affect M-CSF induced VEGF production in femoral muscles, and the VEGF level was significantly higher than that in controls (∗, p < 0.05). Results are presented as the mean ± SD of five mice in each group. To confirm the effect of M-CSF on VEGF production in vitro, we cultured mouse myoblast cell line C2C12 cells with M-CSF. First, we cultured C2C12 myoblasts in GM. VEGF was detected in culture supernatants, but M-CSF treatment did not increase the VEGF level (Fig. 6⇓A, left). We next cultured C2C12 cells in DM. C2C12 cells cultured in DM for 48–72 h are induced to differentiate, and the cells fuse to form multinucleated myotubes (34). C2C12 myotubes produced more VEGF than C2C12 myoblasts (Fig. 6⇓A). M-CSF treatment of C2C12 myotubes significantly enhanced VEGF production (Fig. 6⇓A, right). Fibroblasts also exist in skeletal muscles. To investigate the effect of M-CSF on VEGF production by fibroblasts, mouse fibroblast cell line NIH-3T3 cells were cultured with M-CSF. VEGF was detected in culture supernatants, but VEGF production was not enhanced by M-CSF treatment (Fig. 6⇓B, left). Recently, M-CSF treatment of human monocytes was reported to induce VEGF production in vitro (33). Therefore, we cultured mouse macrophage cell line RAW 264.7 cells with M-CSF. VEGF was detected in culture supernatants, and VEGF production was enhanced by M-CSF treatment (Fig. 6⇓B, right). Next, we confirmed the expression of M-CSFR on the cell surface of C2C12 cells by FACS analysis. 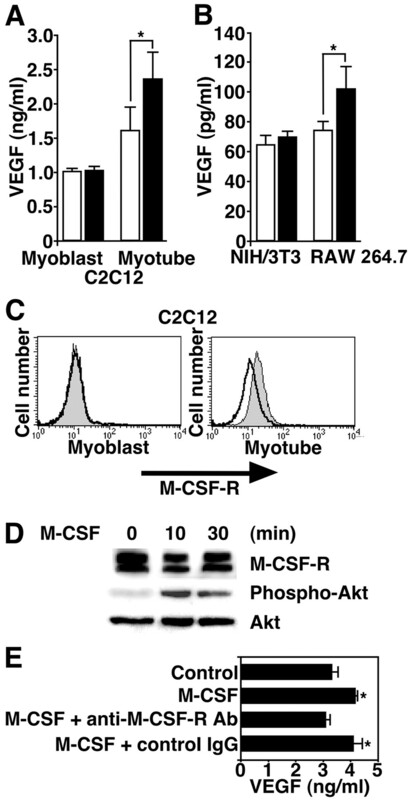 C2C12 myotubes showed M-CSFR expression on the cell surface, whereas C2C12 myoblasts did not (Fig. 6⇓C). M-CSFR activation has been reported to activate Akt signaling pathway in response to M-CSF (35). Moreover, activation of Akt has been reported to mediate VEGF transcriptional activation (36, 37). To confirm the molecular mechanisms of M-CSF-induced VEGF production and M-CSFR activation in C2C12 myotubes, we investigated Akt activation after M-CSF treatment. C2C12 myotubes were cultured in serum-free DMEM for 6 h, then treated with serum-free DMEM containing M-CSF. M-CSF treatment under serum-free conditions induced Akt activation, as indicated by its protein phosphorylation, whereas protein levels of total Akt in cell lysates were equal (Fig. 6⇓D). Similar results were obtained from M-CSF-stimulated C2C12 myotubes in DM. The expression of M-CSFR on C2C12 myotubes was confirmed by Western blot analysis (Fig. 6⇓D). To validate the direct effect of M-CSF on VEGF production in C2C12 myotubes, we cultured C2C12 myotubes with M-CSF and anti-M-CSFR mAb. This treatment inhibited the effect of M-CSF on VEGF production in C2C12 myotubes (Fig. 6⇓E). M-CSF treatment induced skeletal muscle VEGF production and activated the Akt signaling pathway in vitro. ▪, M-CSF treatment; □, controls. A, C2C12 cells were cultured in GM for 1 day, and the VEGF level in supernatants was determined by ELISA. M-CSF (400 U/ml) treatment of C2C12 myoblasts did not enhance VEGF production (left). C2C12 cells were cultured in DM for 6 days. The medium was changed daily. DM collected on day 6 was subjected to VEGF production. M-CSF (400 U/ml) treatment of C2C12 myotubes significantly enhanced the VEGF production (right; ∗, p < 0.05). B, NIH-3T3 cells were cultured for 48 h, and RAW 264.7 cells were cultured for 96 h with or without M-CSF (400 U/ml). The VEGF level in supernatants was determined by ELISA. VEGF was detected in supernatants from NIH-3T3 cells, but it was not enhanced by M-CSF treatment. M-CSF treatment enhanced VEGF production statistically significantly (∗, p < 0.05) in supernatants from RAW 264.7 cells. Each assay in A and B was performed in triplicate. C, M-CSFR expression on C2C12 cells. The shaded histograms indicate staining with anti-M-CSFR mAb, and the blank histograms indicate background staining with control IgG. C2C12 myoblasts were cultured in GM and subjected to flow cytometry. C2C12 myotubes were cultured in DM for 8 days. On day 8, the cells were subjected to flow cytometry. M-CSFR expression was detected on C2C12 myotubes, but not on C2C12 myoblasts. D, Akt activation by M-CSF. C2C12 cells were cultured in GM on day 0. From day 1, C2C12 cells were cultured in DM. DM was changed daily. On day 8, C2C12 myotubes were cultured in serum-free DMEM for 6 h, then stimulated with M-CSF (400 U/ml) in serum-free DMEM for the indicated time periods. The cell lysates were blotted with Abs specific for the activated form of Akt (phospho-Akt) or M-CSFR. The membrane blotted with phospho-Akt was reblotted with an Ab to total Akt. E, C2C12 cells were cultured in GM on day 0. From day 1, C2C12 cells were cultured in DM. DM was changed daily. C2C12 myotubes were cultured with M-CSF (400 U/ml), anti-M-CSFR mAb (500 ng/ml) and M-CSF (M-CSF + anti-M-CSFR Ab), or rat control IgG (500 ng/ml) and M-CSF (M-CSF + control IgG) from day 4. C2C12 myotubes were cultured in the same DM for the following 4 days. DM was collected on day 8, and the VEGF level in supernatants was determined by ELISA. Anti-M-CSFR mAb treatment significantly impaired the effect of M-CSF on VEGF production, and the VEGF level decreased to a level similar to the control value, whereas control IgG did not (∗, p < 0.05). Data are shown as the mean ± SD of triplicate samples. In this study we showed that M-CSF enhanced tumor growth by activating angiogenesis (Figs. 1⇑ and 2⇑). The action of M-CSF might be attributed to an increase in circulating EPCs and/or induction of systemic VEGF rather than a direct effect of M-CSF on cancer cells or ECs (Figs. 1–4⇑⇑⇑⇑). Moreover, in this study we presented the first evidence that M-CSF has the ability to enhance VEGF production in skeletal muscles (Figs. 5⇑ and 6⇑). VEGF have been reported to mobilize EPCs from bone marrow (16, 17). In this study we showed that M-CSF treatment significantly induced an elevation of plasma VEGF (Fig. 4⇑A), and the elevated level of VEGF was comparable to that which mobilized EPCs by itself in a previous study (29). Bone marrow-derived EPCs have been reported to contribute to tumor angiogenesis (10, 11). A previous study suggested that bone marrow-derived EPCs constitute a preponderance of endothelial lineage cells, but there is no epitope that can clearly distinguish ECs from EPCs (29). The EPCs in peripheral blood (or in the circulation) are also called circulating EPs, and the difficulties of characterizing EPCs and circulating EPs have been indicated (31). A recent study showed that when human peripheral blood monocytes were cultured with M-CSF and VEGF, they differentiated into endothelial lineage cells, indicating that a subset of peripheral monocytes behaved as pluripotent stem cells (38). Moreover, Rehman et al. (39) suggested that the majority of circulating low density lipoprotein+/lectin+ cells in healthy human peripheral blood were derived from monocyte/macrophages. Taken together, these findings indicate that the origin of EPCs in M-CSF-treated mice (Fig. 3⇑) might be mainly from pluripotent stem cells in peripheral blood or a mixture of stem cells in bone marrow and pluripotent stem cells in peripheral blood. VEGF plays its most publicized role in cancer. VEGF promotes the proliferation of ECs and new blood vessel formation that appear to be critical in regulating the growth and spread of cancer (9). Recent therapeutic approaches focused on neutralizing VEGF to reduce angiogenesis in the treatment of solid cancer. In this study we also used SU1498, a selective inhibitor for VEGFR-2 tyrosine kinase, to investigate the involvement of VEGF in M-CSF-induced acceleration of tumor growth. SU1498 treatment was effective for the suppression of M-CSF-induced tumor progression (Fig. 4⇑C), suggesting a significant role for VEGF after M-CSF treatment. Taken together with the apparent increase in circulating EPCs after M-CSF treatments, our study suggests that VEGF may play an important role not only in M-CSF-induced recruitment of EPCs, but also in M-CSF-induced acceleration of tumor growth by activating the proliferation of ECs and new blood vessel formation. In patients with breast cancer, the presence of M-CSF or M-CSFRs in the tumor predicts a poor outcome (40). In mice, M-CSF promoted the progression of mammary tumors to malignancy (41) and stimulated tissue invasion of lung cancer cells (42). Moreover, M-CSF antisense treatment suppressed tumor growth in mice and down-regulated the expression of VEGF in tumor lysates (8). These observations suggested that M-CSF is an important growth factor in tumor progression, but the specific mechanism of M-CSF in tumor progression has not been elucidated. We speculate that M-CSF-promoted angiogenesis via VEGF induction may be a part of the explanation. M-CSF injection in vivo induced an increase in both VEGF mRNA and protein in skeletal muscles (Fig. 5⇑, A and C). Moreover, M-CSF stimulation increased VEGF protein in culture medium of C2C12 myotubes, which was significantly inhibited by addition of M-CSFR-neutralizing Ab (Fig. 6⇑E). Recently, it was reported that myogenic Akt signaling promoted VEGF synthesis in skeletal muscle cells, including C2C12 myotubes (36). Because M-CSF is known to activate Akt in NIH-3T3 fibroblasts transfected with M-CSFR (35), we investigated whether M-CSF stimulation activated Akt in C2C12 myotubes after confirmation of the existence of M-CSFR on C2C12 myotubes (Fig. 6⇑, C and D). We found that M-CSF stimulation increased phosphorylated Akt protein in C2C12 myotubes, suggesting that M-CSF activated Akt signaling via M-CSFR stimulation in skeletal muscle cells. Because Akt is often functioning upstream of VEGF synthesis (36, 37), it is conceivable that M-CSF promotes the synthesis of VEGF via Akt signaling in skeletal muscle cells. Recently, it was reported that M-CSF induced VEGF production from human monocytes in vitro (33). In this study we present the first evidence that M-CSF dramatically induced VEGF production in vivo. Moreover, carageenan and anti-CD11b mAb treatment of mice did not affect the VEGF level in skeletal muscles after M-CSF treatment, suggesting the important role of skeletal muscles as a source of VEGF. Because skeletal muscles make up about one-third of the total body mass, it is very possible that systemic VEGF elevation can be attributed to M-CSF-induced VEGF production in skeletal muscles in addition to monocyte/macrophages. In summary, we demonstrated that M-CSF activated tumor angiogenesis and increased EPCs in cancer animal models, which led to the acceleration of tumor growth. We also demonstrated that M-CSF induced the elevation of plasma VEGF in vivo and showed the possibility that M-CSF performed its actions at least in part through the systemic elevation of VEGF, presumably produced by skeletal muscles. These results suggest that clinicians should be careful when performing treatment with excessive use of M-CSF of cancer patients with residual tumors. We are grateful to Drs. H. Kubo, M. Yamada, and James P. Butler for helpful comments, and to Eri Fujita and Grant Crittenden for their assistance. ↵1 This work was supported by research grants from the Kanae Foundation for Life and Socio-Medical Science (to S.E.). ↵3 Abbreviations used in this paper: EC, endothelial cell; Dil-acLDL, acetylated low density lipoprotein, Dil complex; DM, differentiation medium; EPC, endothelial progenitor cell; GM, growth medium; HMVEC, human microvascular endothelial cell; LLC, Lewis lung carcinoma cell; MVD, microvessel density; VEGF, vascular endothelial growth factor; VE-cadherin, vascular endothelial-cadherin; WST, water-soluble tetrazolium. Ohno, R., S. Miyawaki, K. Hatake, K. Kuriyama, K. Saito, A. Kanamaru, T. Kobayashi, Y. Kodera, K. Nishikawa, S. Matsuda, et al 1997. Human urinary macrophage colony-stimulating factor reduces the incidence and duration of febrile neutropenia and shortens the period required to finish three courses of intensive consolidation therapy in acute myeloid leukemia: a double-blind controlled study. J. Clin. Oncol. 15: 2954-2965. Kawakami, Y., N. Nagai, K. Ohama, K. Zeki, Y. Yoshida, E. Kuroda, U. Yamashita. 2000. Macrophage-colony stimulating factor inhibits the growth of human ovarian cancer cells in vitro. Eur. J. Cancer 36: 1991-1997. Stanley, E. R., K. L. Berg, D. B. Einstein, P. S. Lee, F. J. Pixley, Y. Wang, Y. G. Yeung. 1997. Biology and action of colony-stimulating factor-1. Mol. Reprod. Dev. 46: 4-10. Hidaka, T., M. Fujimura, M. Sakai, S. Saito. 2001. Macrophage colony-stimulating factor prevents febrile neutropenia induced by chemotherapy. Jpn. J. Cancer Res. 92: 1251-1258. Mizutani, K., S. Takeuchi, Y. Ohashi, M. Yakushiji, H. Nishimura, T. Takahashi, T. Maruhashi, K. Ueda, K. Noda, Y. Watanabe, et al 2003. Clinical usefulness of macrophage colony-stimulating factor for ovarian cancers: long-term prognosis after five years. Oncol. Rep. 10: 127-131. Bock, S. N., R. B. Cameron, P. Kragel, J. J. Mule, S. A. Rosenberg. 1991. Biological and antitumor effects of recombinant human macrophage colony-stimulating factor in mice. Cancer Res. 51: 2649-2654. Morita, T., K. Ikeda, M. Douzono, M. Yamada, F. Kimura, K. Kawakami, K. Sasaki, K. Motoyoshi, J. Takahara, S. Irino. 1996. Tumor vaccination with macrophage colony-stimulating factor-producing Lewis lung carcinoma in mice. Blood 88: 955-961. Aharinejad, S., D. Abraham, P. Paulus, H. Abri, M. Hofmann, K. Grossschmidt, R. Schafer, E. R. Stanley, R. Hofbauer. 2002. Colony-stimulating factor-1 antisense treatment suppresses growth of human tumor xenografts in mice. Cancer Res. 62: 5317-5324. Folkman, J.. 1995. Angiogenesis in cancer, vascular, rheumatoid and other disease. Nat. Med. 1: 27-31. Lyden, D., K. Hattori, S. Dias, C. Costa, P. Blaikie, L. Butros, A. Chadburn, B. Heissig, W. Marks, L. Witte, et al 2001. Impaired recruitment of bone-marrow-derived endothelial and hematopoietic precursor cells blocks tumor angiogenesis and growth. Nat. Med. 7: 1194-1201. Davidoff, A. M., C. Y. Ng, P. Brown, M. A. Leary, W. W. Spurbeck, J. Zhou, E. Horwitz, E. F. Vanin, A. W. Nienhuis. 2001. Bone marrow-derived cells contribute to tumor neovasculature and, when modified to express an angiogenesis inhibitor, can restrict tumor growth in mice. Clin. Cancer Res. 7: 2870-2879. Bussolino, F., M. Ziche, J. M. Wang, D. Alessi, L. Morbidelli, O. Cremona, A. Bosia, P. C. Marchisio, A. Mantovani. 1991. In vitro and in vivo activation of endothelial cells by colony-stimulating factors. J. Clin. Invest. 87: 986-995. Takahashi, T., C. Kalka, H. Masuda, D. Chen, M. Silver, M. Kearney, M. Magner, J. M. Isner, T. Asahara. 1999. Ischemia- and cytokine-induced mobilization of bone marrow-derived endothelial progenitor cells for neovascularization. Nat. Med. 5: 434-438. Natori, T., M. Sata, M. Washida, Y. Hirata, R. Nagai, M. Makuuchi. 2002. G-CSF stimulates angiogenesis and promotes tumor growth: potential contribution of bone marrow-derived endothelial progenitor cells. Biochem. Biophys. Res. Commun. 297: 1058-1061. Ferrara, N., H. P. Gerber, J. LeCouter. 2003. The biology of VEGF and its receptors. Nat. Med. 9: 669-676. Heissig, B., K. Hattori, S. Dias, M. Friedrich, B. Ferris, N. R. Hackett, R. G. Crystal, P. Besmer, D. Lyden, M. A. Moore, et al 2002. Recruitment of stem and progenitor cells from the bone marrow niche requires MMP-9 mediated release of kit-ligand. Cell 109: 625-637. Asahara, T., T. Takahashi, H. Masuda, C. Kalka, D. Chen, H. Iwaguro, Y. Inai, M. Silver, J. M. Isner. 1999. VEGF contributes to postnatal neovascularization by mobilizing bone marrow-derived endothelial progenitor cells. EMBO J. 18: 3964-3972. Ogikubo, Y., M. Norimatsu, K. Noda, J. Takahashi, M. Inotsume, M. Tsuchiya, Y. Tamura. 2004. Evaluation of the bacterial endotoxin test for quantification of endotoxin contamination of porcine vaccines. Biologicals 32: 88-93. Okazaki, T., S. Sakon, T. Sasazuki, H. Sakurai, T. Doi, H. Yagita, K. Okumura, H. Nakano. 2003. Phosphorylation of serine 276 is essential for p65 NF-κB subunit-dependent cellular responses. Biochem. Biophys. Res. Commun. 300: 807-812. Dimmeler, S., A. Aicher, M. Vasa, C. Mildner-Rihm, K. Adler, M. Tiemann, H. Rutten, S. Fichtlscherer, H. Martin, A. M. Zeiher. 2001. HMG-CoA reductase inhibitors (statins) increase endothelial progenitor cells via the PI 3-kinase/Akt pathway. J. Clin. Invest. 108: 391-397. Weidner, N., J. P. Semple, W. R. Welch, J. Folkman. 1991. Tumor angiogenesis and metastasis: correlation in invasive breast carcinoma. N. Engl. J. Med. 324: 1-8. Seno, H., M. Oshima, T. O. Ishikawa, H. Oshima, K. Takaku, T. Chiba, S. Narumiya, M. M. Taketo. 2002. Cyclooxygenase 2- and prostaglandin E2 receptor EP2-dependent angiogenesis in Apc(Delta716) mouse intestinal polyps. Cancer Res. 62: 506-511. Kawakami, K., M. Kawakami, R. K. Puri. 2004. Nitric oxide accelerates interleukin-13 cytotoxin-mediated regression in head and neck cancer animal model. Clin. Cancer Res. 10: 5264-5270. Goldmann, O., M. Rohde, G. S. Chhatwal, E. Medina. 2004. Role of macrophages in host resistance to group A streptococci. Infect. Immun. 72: 2956-2963. Van Lent, P. L., A. Blom, A. E. Holthuysen, C. W. Jacobs, L. B. Van De Putte, W. B. Van Den Berg. 1997. Monocytes/macrophages rather than PMN are involved in early cartilage degradation in cationic immune complex arthritis in mice. J. Leukocyte. Biol. 61: 267-278. Takeda, K., N. Yamaguchi, H. Akiba, Y. Kojima, Y. Hayakawa, J. E. Tanner, T. J. Sayers, N. Seki, K. Okumura, H. Yagita, et al 2004. Induction of tumor-specific T cell immunity by anti-DR5 antibody therapy. J. Exp. Med. 199: 437-448. Kanda, A., S. Ebihara, H. Takahashi, H. Sasaki. 2003. 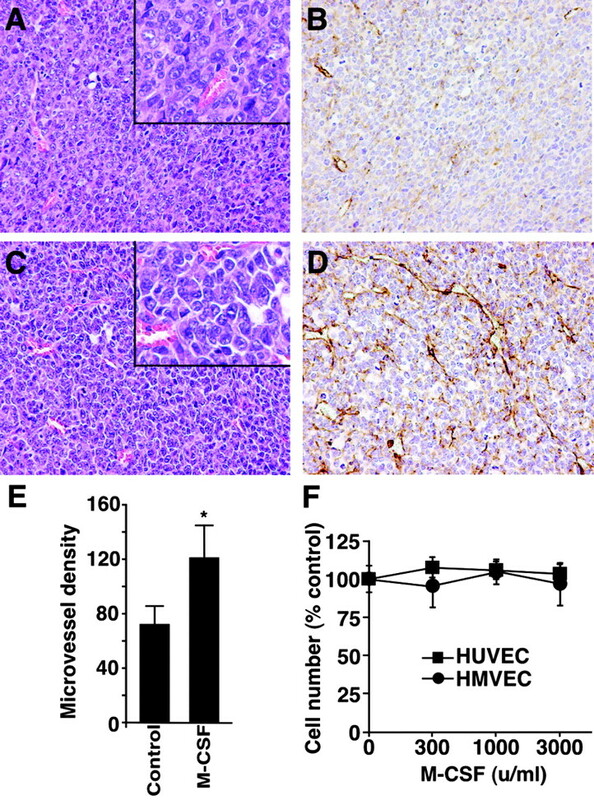 Loxoprofen sodium suppresses mouse tumor growth by inhibiting vascular endothelial growth factor. Acta Oncol. 42: 62-70. Sakon, S., X. Xue, M. Takekawa, T. Sasazuki, T. Okazaki, Y. Kojima, J. H. Piao, H. Yagita, K. Okumura, T. Doi, et al 2003. NF-κB inhibits TNF-induced accumulation of ROS that mediate prolonged MAPK activation and necrotic cell death. EMBO J. 22: 3898-3909. Kalka, C., H. Masuda, T. Takahashi, R. Gordon, O. Tepper, E. Gravereaux, A. Pieczek, H. Iwaguro, S. I. Hayashi, J. M. Isner, et al 2000. Vascular endothelial growth factor (165) gene transfer augments circulating endothelial progenitor cells in human subjects. Circ. Res. 86: 1198-1202. Vasa, M., S. Fichtlscherer, A. Aicher, K. Adler, C. Urbich, H. Martin, A. M. Zeiher, S. Dimmeler. 2001. Number and migratory activity of circulating endothelial progenitor cells inversely correlate with risk factors for coronary artery disease. Circ. Res. 89: E1-E7. Rafii, S., D. Lyden. 2003. Therapeutic stem and progenitor cell transplantation for organ vascularization and regeneration. Nat. Med. 9: 702-712. Strawn, L. M., G. McMahon, H. App, R. Schreck, W. R. Kuchler, M. P. Longhi, T. H. Hui, C. Tang, A. Levitzki, A. Gazit, et al 1996. Flk-1 as a target for tumor growth inhibition. Cancer Res. 56: 3540-3545. Eubank, T. D., M. Galloway, C. M. Montague, W. J. Waldman, C. B. Marsh. 2003. M-CSF induces vascular endothelial growth factor production and angiogenic activity from human monocytes. J. Immunol. 171: 2637-2643. Germani, A., A. Di Carlo, A. Mangoni, S. Straino, C. Giacinti, P. Turrini, P. Biglioli, M. C. Capogrossi. 2003. Vascular endothelial growth factor modulates skeletal myoblast function. Am. J. Pathol. 163: 1417-1428. Kelley, T. W., M. M. Graham, A. I. Doseff, R. W. Pomerantz, S. M. Lau, M. C. Ostrowski, T. F. Franke, C. B. Marsh. 1999. Macrophage colony-stimulating factor promotes cell survival through Akt/protein kinase B. J. Biol. Chem. 274: 26393-26398. Takahashi, A., Y. Kureishi, J. Yang, Z. Luo, K. Guo, D. Mukhopadhyay, Y. Ivashchenko, D. Branellec, K. Walsh. 2002. Myogenic Akt signaling regulates blood vessel recruitment during myofiber growth. Mol. Cell. Biol. 22: 4803-4814. Skinner, H. D., J. Z. Zheng, J. Fang, F. Agani, B. H. Jiang. 2004. Vascular endothelial growth factor transcriptional activation is mediated by hypoxia-inducible factor 1α, HDM2, and p70S6K1 in response to phosphatidylinositol 3-kinase/AKT signaling. J. Biol. Chem. 279: 45643-45651. Zhao, Y., D. Glesne, E. Huberman. 2003. A human peripheral blood monocyte-derived subset acts as pluripotent stem cells. Proc. Natl. Acad. Sci. USA 100: 2426-2431. Rehman, J., J. Li, C. M. Orschell, K. L. March. 2003. Peripheral blood “endothelial progenitor cells” are derived from monocyte/macrophages and secrete angiogenic growth factors. Circulation 107: 1164-1169. Sapi, E., B. M. Kacinski. 1999. The role of CSF-1 in normal and neoplastic breast physiology. Proc. Soc. Exp. Biol. Med. 220: 1-8. Lin, E. Y., A. V. Nguyen, R. G. Russell, J. W. Pollard. 2001. Colony-stimulating factor 1 promotes progression of mammary tumors to malignancy. J. Exp. Med. 193: 727-740. Pei, X. H., Y. Nakanishi, K. Takayama, F. Bai, N. Hara. 1999. Granulocyte, granulocyte-macrophage, and macrophage colony-stimulating factors can stimulate the invasive capacity of human lung cancer cells. Br. J. Cancer 79: 40-46.